Each month, The Wilmington Business Journal features industry leaders discussing the trends and topics that are affecting businesses across the state. For September, Greene Resources’ VP of Recruiting Solutions, Jason deFreitas, was part of a panel that discussed technology and the increasingly important role it is playing at all levels of organizations. Other panelists included Keith Holden (CEO of ATMC), Dean Exline (Founder and President of DocuVid Global), and Drew Smith (Director of Communications for Copiers Plus). For many companies, technological advancements lead to increased efficiency. This can be seen in more sophisticated data collection methods, improved customer communication, or even something as simple as automatically routing documents. Organizations of all sizes can take advantage of technology solutions to keep them up-to-date and ahead of competition. Here are three insights from the panel to keep in mind as businesses embrace technology. 1. Business Models are Changing. New technology is expanding the capabilities of businesses and pushing them towards offering not just products, but solutions. Customers of every industry are increasingly needing customization from partners who understand their unique needs. Companies should expect to build relationships with technology partners. They can then leverage those solutions to enhance the experience for their own customers. 2. Technology is Raising the Bar for Job Seekers. “Having the basic skills for a job just isn’t enough anymore,” says Exline. The needs of both companies and their clients are evolving rapidly as technology advances. It is critical that job seekers have the current skills to meet those needs. That may mean obtaining specific certifications, staying current on trends and new technologies, or strengthening communication skills to be a bridge between technical departments and non-technical customers. “It’s important to be thorough with the due diligence process when procuring new technology solutions to ensure that all core business requirements are being met,” explained deFreitas . Even small companies with limited budgets can take advantage of technological efficiencies by picking partners that serve as trusted advisers. This allows them to stay ahead of competition and ultimately provide a better experience for customers. When choosing a partner, companies should do their research and look for partners whose values align with their own. As technology continues to be a powerful force of change, successful businesses will be the ones who stay ahead of the curve. At Greene Resources, incorporating artificial intelligence and automation solutions, chatbot technology, and candidate engagement technology into our delivery improves efficiencies. This offers non-biased approaches to screening, and enhances the candidate and hiring authority experiences. As the Top Technical Staffing Company in the Triangle, we are ready to be your trusted adviser in finding the right people to make a lasting impact on your business. Ending the summer on a high note, the number of job postings in August 2018 was over 20% higher than the numbers for August 2017. View the September 2018 report to learn more about last month’s hiring data. View the August 2018 report featuring July’s hiring numbers. 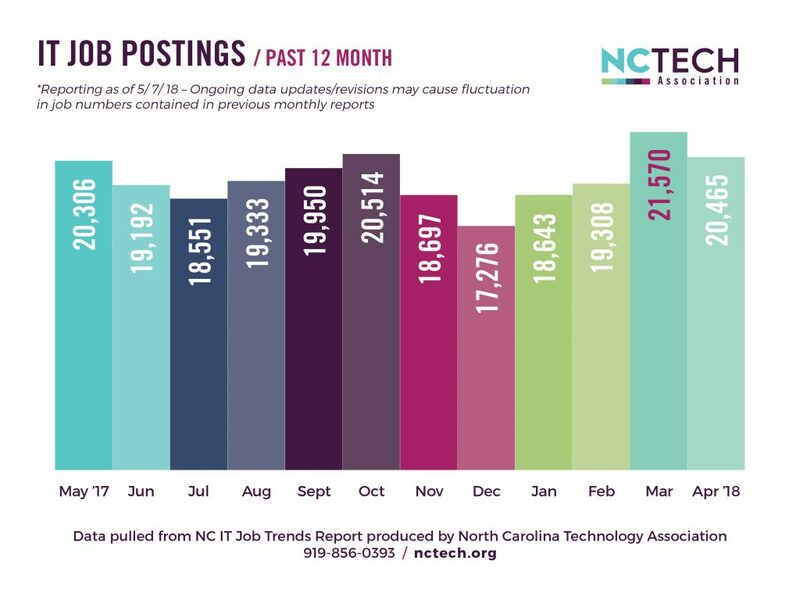 “June IT job openings continue the steady trend of increases during the first half of 2018, and mark the highest level of openings in the past year,” said Brooks Raiford, CEO of NC TECH. View the July 2018 report featuring June’s hiring numbers. View the June 2018 report reflecting May’s hiring numbers. Greene Resources was recognized on May 25, 2018 by The Triangle Business Journal as the Top Technical Staffing Company in the Triangle. This is the second consecutive year that Greene Resources has received this recognition. The Triangle Business Journal’s annual Book of Lists provides rankings of top companies throughout the Triangle. These rankings provide valuable data to consumers and businesses. 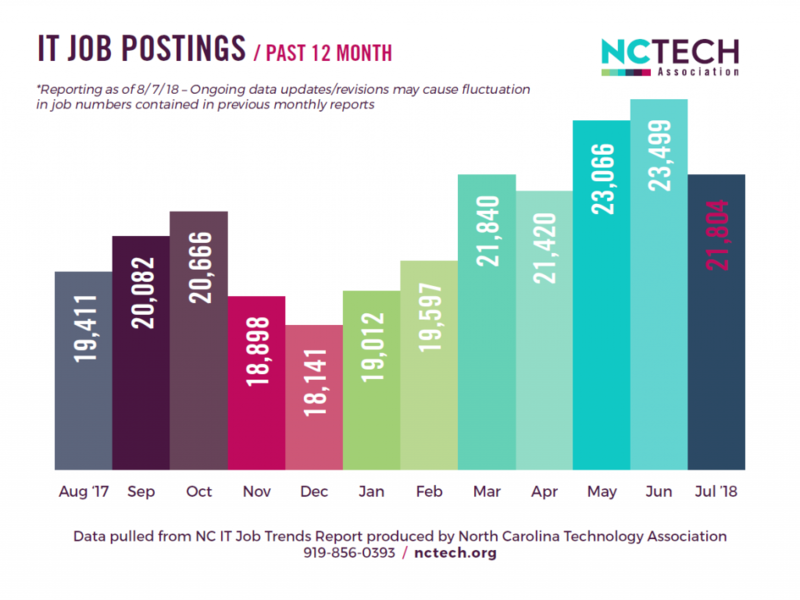 The List of Technical Staffing Companies ranks technical staffing companies in the Triangle by the number of technical persons placed in the area throughout 2017. Greene Resources invests its time and energy into locating talented people who care about what they do. It’s more than just filling a job opening. It’s about finding the one person who will make a lasting impact on their company’s team and culture, as well as feel accomplished through their work. Are you are looking for top talent or a new purposeful and long-term career? Greene Resources’ expertise in the recruiting industry can be a strong resource for you and your business. Interested in learning more about how Greene Resources can help your business? Read more about our Technology Solutions or contact one of our Client Relationship Managers today. Creative benefits regarding work flexibility remain a top priority for job seekers and employees. A 2017 survey conducted by FlexJobs showed that 81% of respondents would prefer the option to telecommute full-time, while 70% prefer a flexible schedule. A recent survey by tech job board Dice.com showed 63% of tech talent would be willing to take a pay cut in order to work remotely full-time. Furthermore, remote working is on the rise, with close to 3% of the total US workforce working from home at least 50% of the time, a 115% increase in remote workers since 2005. If your company has employees who are not needed to be physically in the office every day of the week, or if there is work that can be done outside of traditional business hours, consider implementing flexible schedules where employees can adjust their hours and work remotely on an as-needed or ongoing basis. As tech positions continue to grow in non-tech sectors, and as tech talent has become increasingly harder to find, non-tech employers have expanded continuous learning opportunities aimed at nurturing and developing their tech talent. With increased training, certifications, and educational opportunities, employees can expand their skillset and be more qualified for advancing their career within your company, which saves your business the time and money that would have been spent recruiting and hiring outside hires. Often when employees continue to develop their skills, they may realize they want to pursue other positions, either by seeking promotions in the same department, or pursuing new roles where they can make a lateral move. Providing employees an opportunity to experiment with other roles within your company is a creative and low-risk way for high-performing employees to pursue new goals without leaving your business. By considering one or more of these creative benefits to offer employees, you will be providing opportunities that top talent desire, but cannot always find. Only 22% of tech employers currently offer remote work, and a recent study by Middlesex University showed that 74% of employees have indicated their workplace has a lack of development or growth opportunities. These statistics can be a key factor in setting your business apart from other companies and provide access to a pool of talent that may not have previously been available. View the May 2018 report reflecting April’s hiring numbers. The Greater Raleigh Chamber of Commerce held their annual Women’s Leadership Conference on May 3, 2018, where Greene Resources was a platinum sponsor. During this event, business leaders and managers from companies across the Triangle gathered to network and learn from local and national experts. The topic for this event was the importance for businesses to champion women and diversity in the workplace. Breakout sessions included themes like the differences in communication styles between men and women and the ROI behind championing diversity in leadership. Featured panelists included Farad Ali (President and CEO of The NC Institute of Minority Economic Development), Leah Brown (President and CEO of A10 Solutions), and Margaret Spellings (UNC President and former Secretary of Education). The keynote speaker was Carey Lohrenz, a former lieutenant in the US Navy and the first fully qualified female naval aviator to fly the F-14 Tomcat in the US military. Breaking down obstacles to inclusion for women and minorities in leadership is a business imperative. Choosing not to build inclusive businesses and teams limits your business and your ability to grow and scale. Studies have shown that having more diverse and inclusive teams results in higher collaboration, retention, engagement, increased market share, and more opportunities to move into new markets. Women are more likely to wait to ask for a promotion, raise, or new opportunity until a year after they are actually qualified for the position, while men are more likely to ask for more opportunities a year before they are ready. Business leaders tend to network and do business with people they know, like, and trust, who are often similar to themselves. Leaders should be intentional about expanding their social network and advocating for women and minorities to be included in the conversation. Your company’s goal in hiring should be to create opportunities, not obstacles, for success. To create a more diverse team, business leaders need to develop action-oriented goals. Use resources like a manager and recruiter training and AI technology to develop processes to mitigate and minimize conscious, unconscious, and systemic bias in the hiring process. Diversity and inclusion in the workplace provide a greater lens through which to view the world, offers more opportunities for growth and development, and positively impacts the bottom line of businesses who prioritize it. By focusing on empowering those around you and looking for opportunities to champion the successes of others, you can positively impact your network, community, and business.